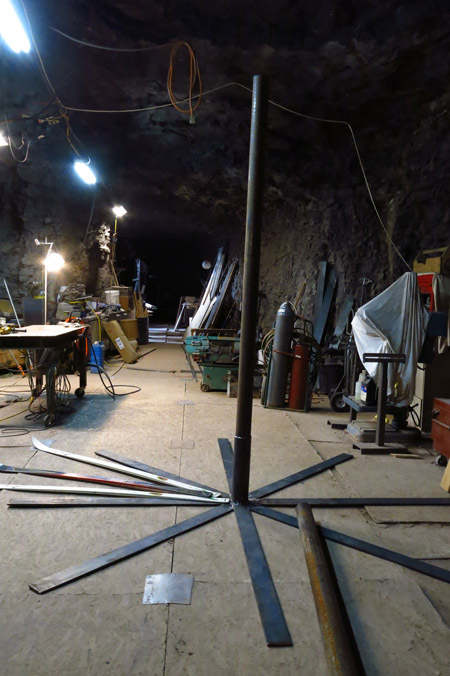 After finishing up with the Bridal Veil welding project, Anton was approached about an interesting new job for us. 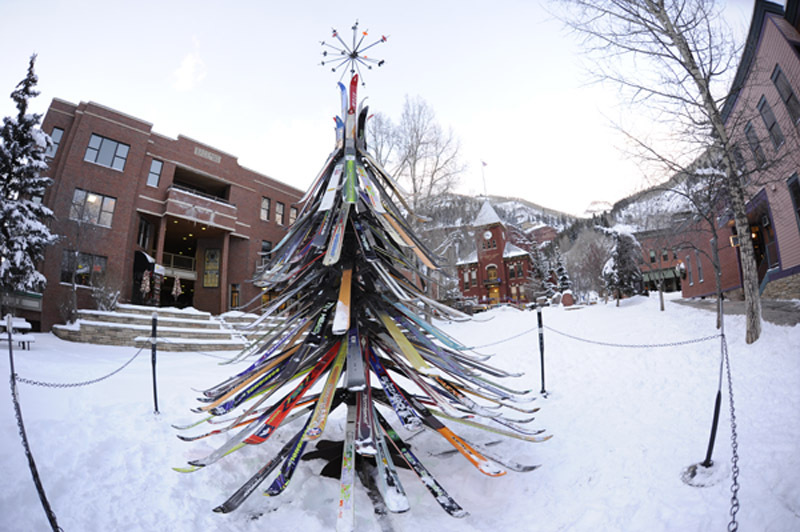 People from the town in Telluride were interested in having Anton build a holiday Christmas tree out of old skis. I was brought in to work on the project and helped Anton with a large portion of the welding and fabrication. Anton brought a design to the table and we worked on creating a simple bracket that we could reproduce and make subtle modifications to that would create the variations necessary from on ski to the next and one layer of skis to the next. 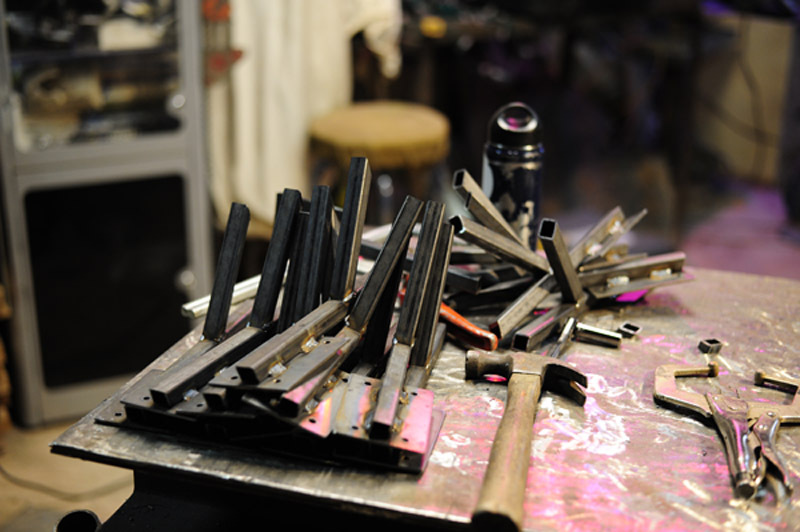 A pile of brackets welded up to hold the skis to the center sleeves. In order to make the tree mobile, we made it out of many modular pieces that get assembled on site. 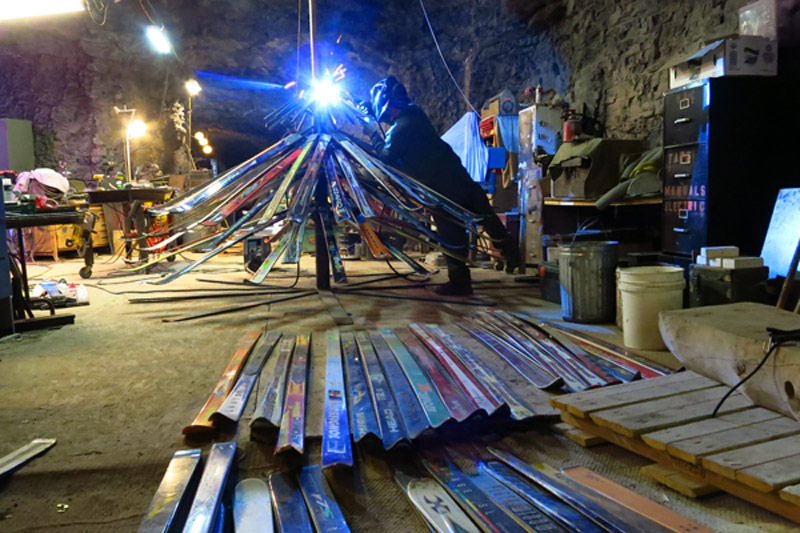 The final tree comprised of a base made of ½” plate steel with a center column to hold the main pole, a main pole that stands 14’ tall, and 6 center sections that hold the skis. 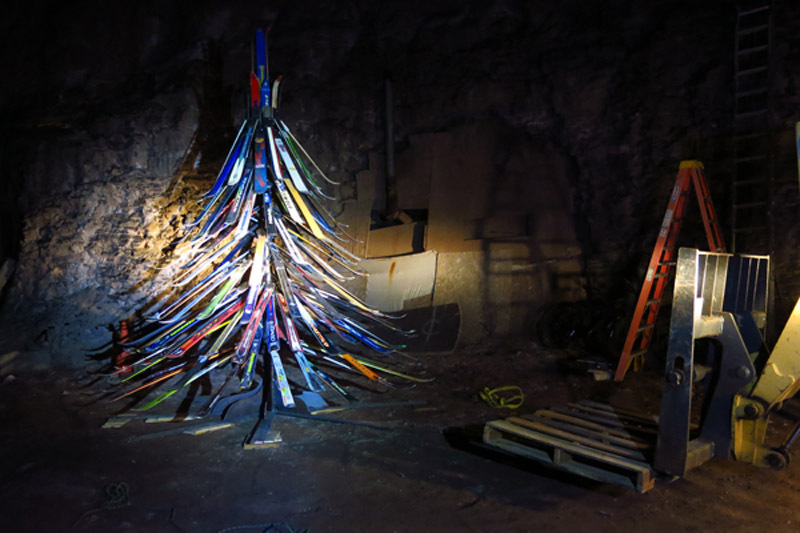 Due to height restrictions inside the mine, we were unable to build the entire tree inside at one time. As a result we resorted to building the tree in two pieces, the first 3 layers and then the last 3 layers. In the end, when we finally assembled in outside before delivery, we noticed some thin spots between the two halves that we never saw assembled together as we were building it. The day the town workers came out to pick up the tree for its debut we added a dozen skis around the midsection to help fill in the gaps. Here is the base welded from 1/2″ plate steel with the center column in place. 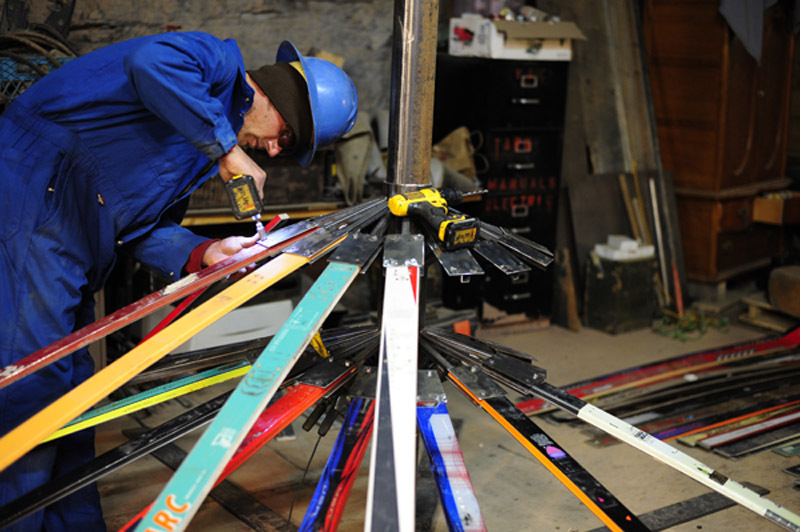 Cutting and drilling over 150 skis. 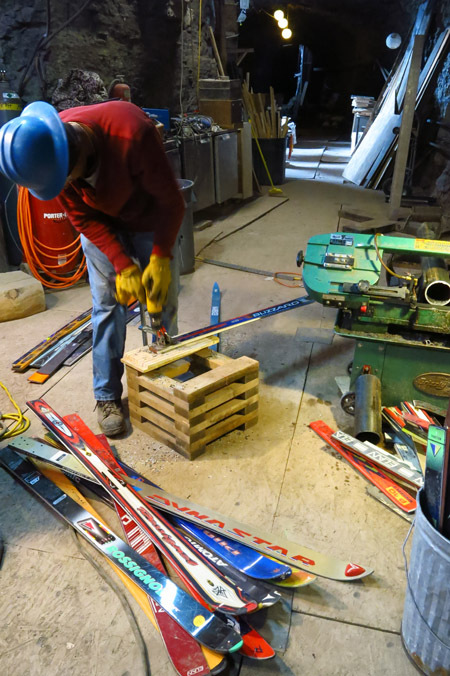 Attaching skis to the tree to get an idea of layout and how things will look. In the end, we had to rent a high lift, telescoping boom fork lift to assemble all the pieces. From the second we finished assembling the tree in town at its final destination, people were taking their pictures in front of it. Later that week, the town had an elaborate coming of winter/tree lighting ceremony for which most of the town showed up to witness. Welding some of the brackets to the center column. After assembling the tree for the first time the day before delivery. 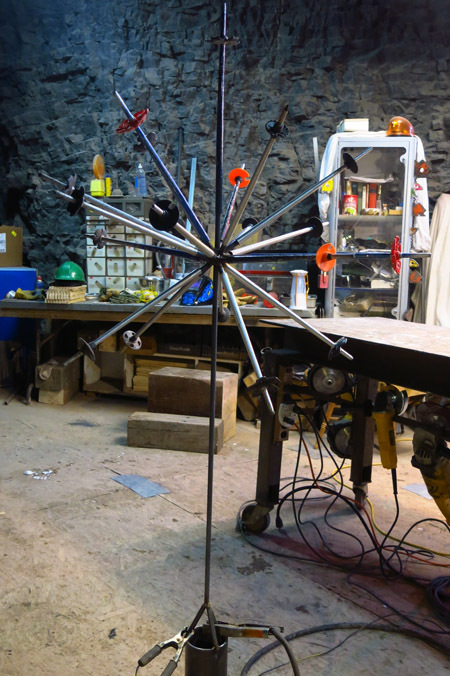 The day of delivery I welded up a start to the top the tree made of old ski poles. The tree delivered–assembled in place in the center of town.